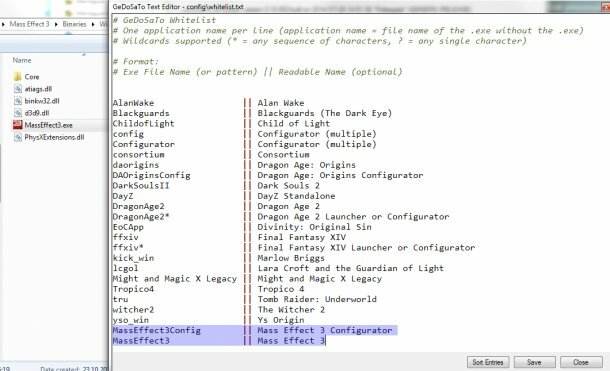 In 2012, Peter “Durante” Thoman wrote the popular mod DSfix for Dark Souls: Prepare to Die on PC. In April 2014, he wrote a series of articles for PC Gamer about modding Dark Souls 2 . 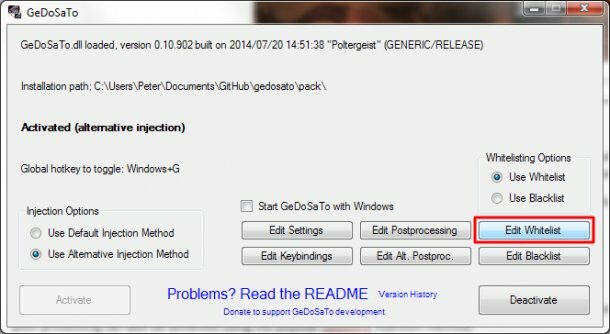 About 3 months ago, at the same time as the PC release of Dark Souls 2, I released a new tool called GeDoSaTo . At first, it primarily focused on offering a set of graphical enhancement for DS2, but also supported downsampling in a limited set of DirectX 9 games. Since then, its scope and applicability have expanded greatly. Dark Souls 2 is now just one plugin rather than the main focus, compatibility has increased greatly—at this point in time it’s more likely for any random DX9 game to be supported than not—and new, higher quality downsampling algorithms were added. Crucially, the full source code for GeDoSaTo is now available on GitHub , and I welcome all contributions, including bug-fixes, feature or compatibility enhancements and new game profiles. And this is where this article comes in—it is not necessary to know any programming to make significant enhancements to specific games, thanks to the power of the generic plugin. GeDoSaTo’s generic plugin offers all the widely popular functionality of injectors such as SweetFX —SMAA injection, high quality tone mapping, HDR effects, color, contrast, sharpness and gamma adjustments and more—but better, as it allows you to target the application of those effects exactly to where they are needed, while not affecting UI elements or the HUD of games . 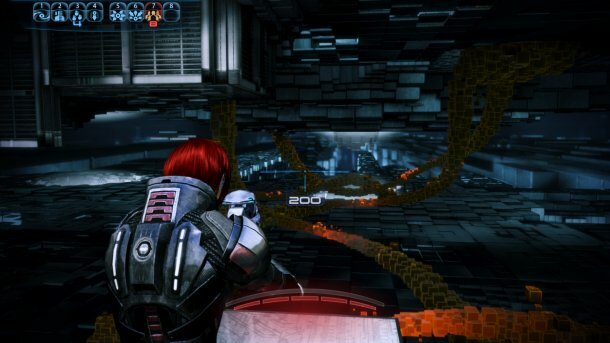 This article will teach you how to use these capabilities in your own games, and walk through the entire process using Mass Effect 3 as an example. 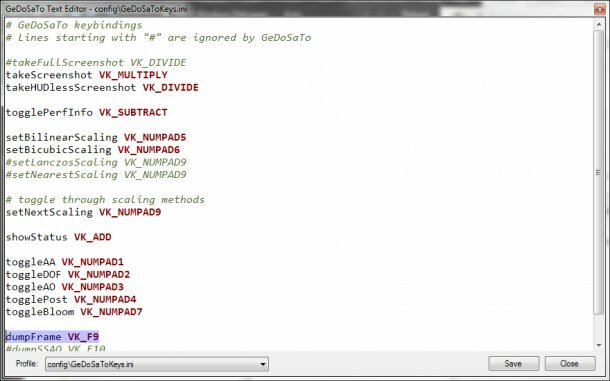 With GeDoSaTo becoming more general, there was a need to be able to target individual games without polluting the entire codebase. The solution is a plugin system, which allows for plugins written in C++. However, while that is a very powerful solution, it is overkill for most uses and requires some familiarity with programming. Downsampling from arbitrary resolutions (the fundamental purpose of GeDoSaTo). 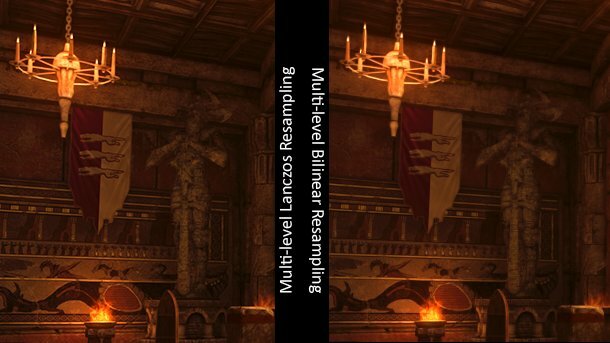 Injecting either SMAA or FXAA post-processing anti-aliasing. Post-processing, AA and screenshot targeting to individual pixel shaders. Points (1) to (3) are rather simple and straightforward to use. Select the desired settings in the configuration file, optionally edit the shader files and you are set. Of course, the same types of post-processing can also be achieved using SweetFX. Point (4) is where GeDoSaTo distinguishes itself. When you use a SweetFX injector to add some post-processing effects, they will always be applied to the final rendered image, which means that the HUD and various UI elements will be processed as well. 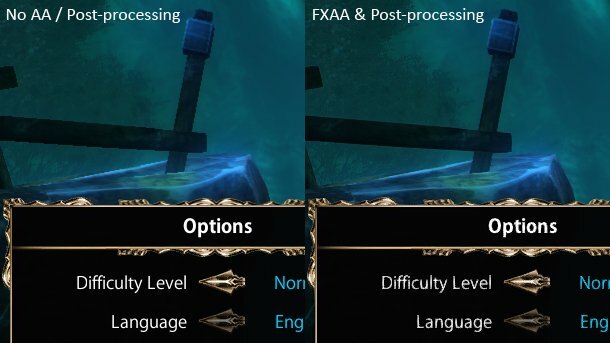 Particularly with FXAA and heavier post-processing this can be quite detrimental to the image quality of UI elements, especially that of text. The following image shows the menu screen of Blackguards, both with and without FXAA and post-processing. As you can see, the injected processing greatly improves the quality of the rendered background elements and cleans up their edges nicely, but it also reduces the clarity of the text and even introduces some artifacts in the 2D elements. This means that when you use a SweetFX injector to change color saturation or add AA, these changes affect the UI as well—and often be detrimental to its quality, as in the example above. Ideally, we would inject post-processing which only affects the rendered image, but not the HUD/UI elements—and that is exactly what GeDoSaTo provides. In the rest of this article, I’ll walk through the steps of creating game-specific post-processing plugins that will only affect a game’s graphics, not its UI. This brings up a text editor, which allows you to add executable names—or patterns to match multiple files—to the existing list. 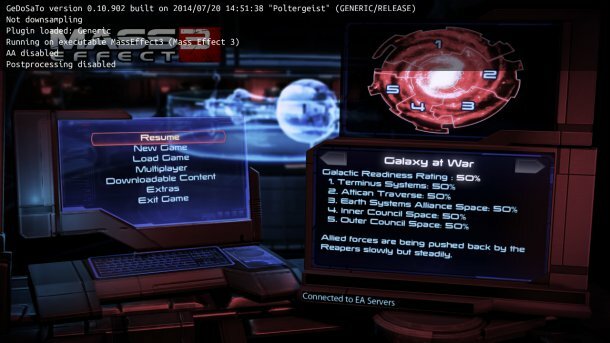 For Mass Effect 3, we need to add “MassEffect3Config” and “MassEffect3”—you can usually find these names by navigating to a game’s installation directory. Note that the whitelist also allows you to enter an additional name for each listed program—in the case of ME3 this is hardly necessary, but it helps for more obscure files such as “lcgol” or “EoCApp”. After editing the whitelist, you can press “Sort Entries” to have the entries automatically sorted, and don’t forget to save, either with the button or by pressing Ctrl+S. Now we are almost ready to go, but to investigate how to perform HUD-less processing we still need to enable frame dumping (this allows us to record the rendering process of the game, which we will need to identify when exactly we want our injection to happen). After this preliminary setup, it’s time to start building a plugin for Mass Effect 3. First, I suggest configuring the game to run at a low resolution, such as 1280×720, and in windowed mode. This is not strictly necessary, but greatly speeds up the overall process. Also, make sure to enable all the graphical settings you want to use later when playing, as changing them might change the shaders the game uses and render all our subsequent findings obsolete. The next step is to press the key bound to the “dumpFrame” action (F9 by default), which causes GeDoSaTo to write out a detailed log of all the relevant rendering actions performed by the game for the next frame, and also an image dump of the current buffer at crucial points. Now might be a good time to brew a nice cup of tea, make a sandwich, check your favorite news site, or perhaps all of the above. What I mean to say is that this process will take a while. After it has finished, all the information required to achieve HUD-less post-processing and screenshot taking is at our disposal. 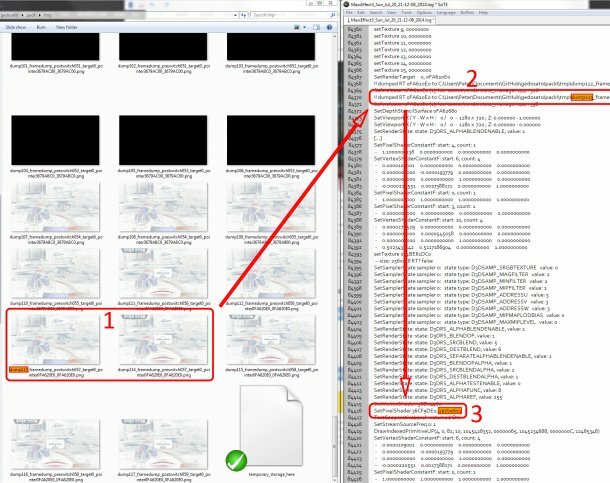 In particular, what we need is the most recent log file—created in the “log” subfolder of the GeDoSaTo installation directory—and the image dumps generated in the “tmp” folder. In the upper row, the usual injection process employed by e.g. SweetFX—and GeDoSaTo without special configuration—is illustrated. Only once a complete frame is rendered does the injection happen, so obviously it applies to both the main rendered 3D scene and any existing HUD elements. Conversely, the lower row shows what happens in a targeted scenario with GeDoSaTo. During rendering, the game configures the GPU to use various pixel shaders (indicated by green lines), and draws geometry with them (red lines). GeDoSaTo assigns a unique identifier (its Hash) to each shader. The injectPSHash parameter then specifies that the processing should take place when a pixel shader with the given identifier is used. Optionally, the processing can also be delayed until after the following draw call by setting injectDelayAfterDraw. What this means is that we can find, for example, the shader used when drawing the first UI element—say a health bar—and instruct GeDoSaTo to perform its processing at the point where the game first uses this specific shader. This way, only the actual game content—rendered before the UI—will be affected by our processing. Find the point in the image dump where the first HUD elements appear. In our case, this happens when going from “dump113” to “dump114”. Use text search to find the corresponding line in the log file. Continue on downwards to the first call of “SetPixelShader.” The second parameter to this call is the hash code we are looking for. One complication you might notice is that the HUD is already displayed in “dump111”. This can happen in many games if a framebuffer used in a previous frame is not cleared. A more solid guideline for (1) in such cases would be “find the last point in the frame dump where no HUD elements are visible”, but a bit of experimentation might be required even so. As you can see, only the 3D rendered parts of the game are affected, while the HUD elements still retain their color. 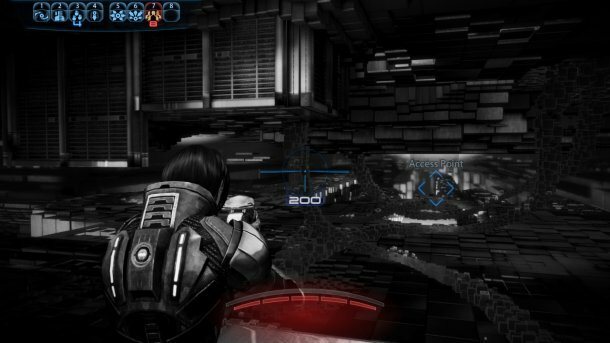 In addition to targeted postprocessing, we can now also use the “takeHUDlessScreenshot” keybinding in Mass Effect 3. While its main purpose is still high-quality downsampling, the current version of GeDoSaTo can also be used as an alternative to SweetFX for the injection of post-processing effects. It goes beyond the scope of similar tools as, with a bit more effort, it can be tuned to apply only where you really want it to, without affecting HUD or UI elements. If you find some hashes or create good profiles for games which are not yet supported, please do take a moment to contribute them to the project at Github, so that all users of GeDoSaTo can benefit from your efforts. Github offers an easy to use interface and plenty of documentation for how to set up pull requests , which are the best way to contribute—and of course your contribution will be immortalized in the GeDoSaTo version history!